Well, it’s National Chocolate Chip Day! Did you know that the chocolate chip cookie was actually a happy accident?! Ruth Wakefield, a lovely innkeeper, known for her baking skills, found herself short of baker’s chocolate one day. Instead of bailing on her waiting guests, she threw caution to the wind, put her fabulous baker reputation on the line and cut up semisweet chocolate into small bits to put in instead. Well, the semisweet chocolate did not melt like the bakers chocolate would and they stayed nearly whole in the cookie. Of course we can guess that the inn Ruth owned was called the Toll House Inn and the semisweet bar… of course made by the Nestle Company. As Nestle semisweet chocolate started soaring off the shelves, Ruth and Andrew Nestle struck a deal. The recipe would be printed on the back of the package and Ruth would never want for chocolate chips again. So, as I watch my kiddos make off with another chocolate chip cookie thinking I am not watching, I have to ask… how do your chips fall? 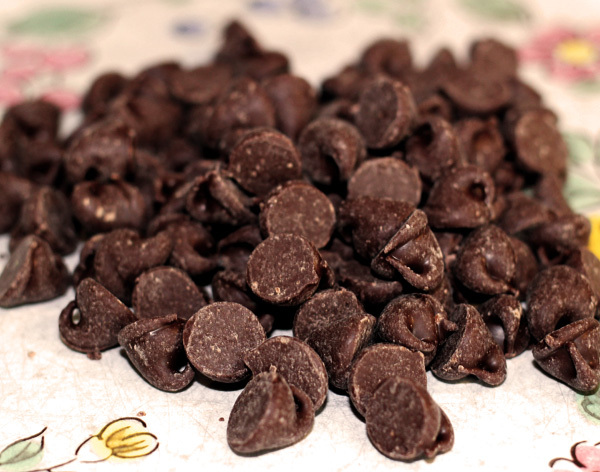 Here’s hoping you find your way to get some yummy chocolate chips into your day today! Thanks! I never knew the story either… till today! Thought it was too perfect not to share :). Thanks for the comment! I learned something new today. Now I’m craving chocolate chip cookies, LOL. I know it! I have to say, they hit the spot! Awesome! So glad you liked it :). Thanks! Don’t do it! I took one for the dieting team yesterday and ate my fair share. TurboFire for me today! 🙂 Thanks for stopping by! I didn’t want to, but after seeing the pics on your post, I just couldn’t resist. And I liked stopping by. 😀 You have an interesting blog.